Virginia Tech is making no apologies for wanting to extend the nation’s longest bowl streak. 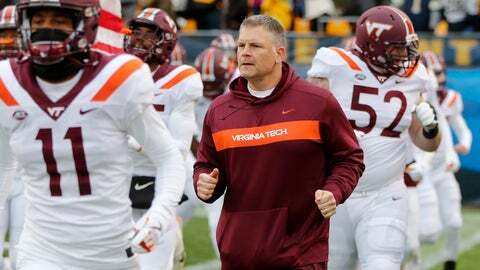 The Hokies (5-6) scheduled a contingency game against Marshall out of Conference-USA before Virginia Tech’s game against rival Virginia last week, saying they would only play the game only if it gave them an opportunity to become bowl eligible. Thanks to an improbable comeback and a 34-31 overtime victory against the Cavaliers, the teams will do just that Saturday at Lane Stadium. The Thundering Herd (8-3) are replacing East Carolina on the Hokies’ schedule. The Pirates were scheduled to play at Virginia Tech on Sept. 15, but concerns about approaching Hurricane Florence led them to pull out of that game early in the week. Virginia Tech has finished each of the last 25 seasons in a bowl game, the longest streak recognized by the NCAA. Florida State finished 5-7 this year, ending a 36-year bowl run that would be the longest in Division I history had the NCAA not vacated their 2006 Emerald Bowl victory against UCLA because of an academic scandal. The streak is important not only on the recruiting trail, but also developmentally. The Hokies defense lost nine starters since last season and has struggled with youth and inexperience. Virginia Tech allowed four teams to score at least 45 points and saw Georgia Tech and Pittsburgh each run for at least 465 yards. That makes this week important, defensive coordinator Bud Foster said, and winning even more important. Marshall will get $300,000 and future scheduling considerations from Virginia Tech. The Thundering Herd would’ve gotten $100,000 for its willingness to play the what-if game if Saturday’s game had been canceled. But a win against Marshall is not a given. The Thundering Herd present a stiff challenge for Virginia Tech, likely more than East Carolina would have. But due to other scheduling conflicts, instead of playing the Hokies, the Pirates (3-8) will play their makeup game at North Carolina State on Saturday. The Hokies are hoping the victory against Virginia, their 15th consecutive in the series, provides them some momentum. But records, Hokies placekicker Brian Johnson noted, is what these games have been about.